Below is an example of what I am trying to obtain. Since many have asked why I would ever want to style half of a character, this is why. My city had recently spent $250,000 to define a new "brand" for itself. This logo is what they came up with. Many people have complained about the simplicity and lack of creativity and continue to do so. 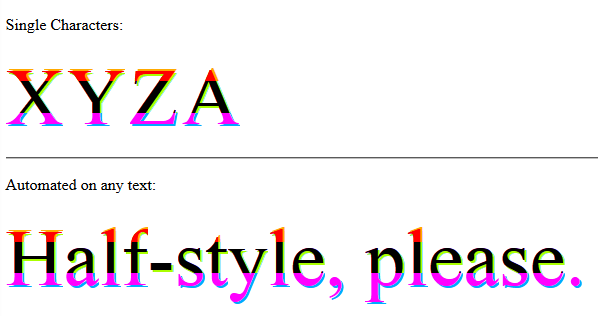 My goal was to come up with this website as a joke. Type in 'Halifax' and you will see what I mean. Now on GitHub as a Plugin! Feel free to fork and improve. This works on any dynamic text, or a single character, and is all automated. All you need to do is add a class on the target text and the rest is taken care of. Also, the accessibility of the original text is preserved for screen readers for the blind or visually impaired. 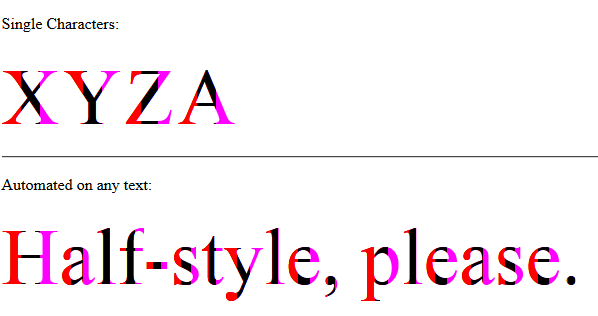 Pure CSS. 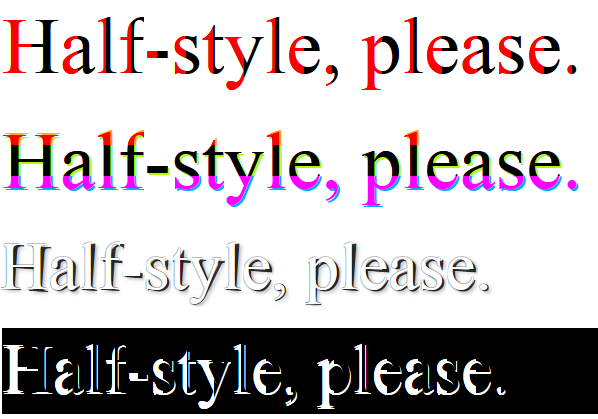 All you need to do is to apply .halfStyle class to each element that contains the character you want to be half-styled. For each span element containing the character, you can create a data attribute, for example here data-content="X", and on the pseudo element use content: attr(data-content); so the .halfStyle:before class will be dynamic and you won't need to hard code it for every instance. Simply add textToHalfStyle class to the element containing the text. With this solution you can style left and right parts, individually and independently. Everything is the same, only more advanced CSS does the magic. Now that we know what is possible, let's create some variations. Customized different Half-Style style-sets can be used on desired elements on the same page. 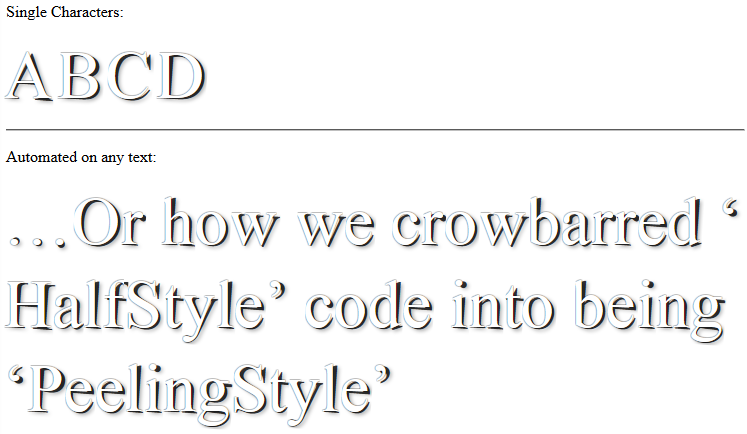 You can define multiple style-sets and tell the plugin which one to use. The plugin uses data attribute data-halfstyle="[-CustomClassName-]" on the target .textToHalfStyle elements and makes all the necessary changes automatically. So, simply on the element containing the text add textToHalfStyle class and data attribute data-halfstyle="[-CustomClassName-]". The plugin will do the rest of the job. I've just finished developing the plugin and it is available for everyone to use! Hope you will enjoy it. That's it! Now you have the Splitchar plugin all set. More info about it at http://razvanbalosin.com/Splitchar.js/. 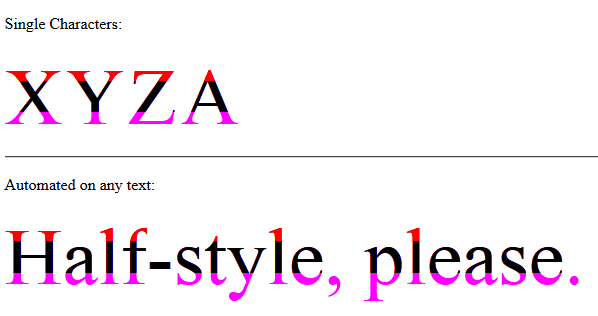 Yes, you can do this with only one character and only CSS. 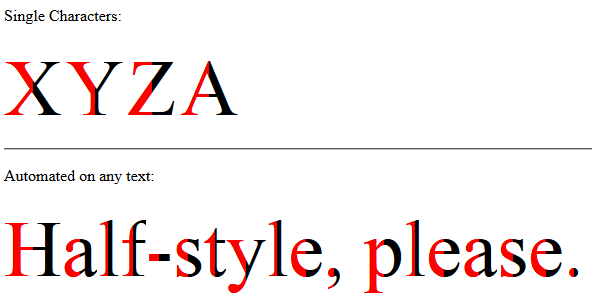 Visually, all the examples that use two characters (be it via JS, CSS pseudo elements, or just HTML) look fine, but note that that all adds content to the DOM which may cause accessibility--as well as text selection/cut/paste issues. We'll do it using just CSS pseudo selectors! 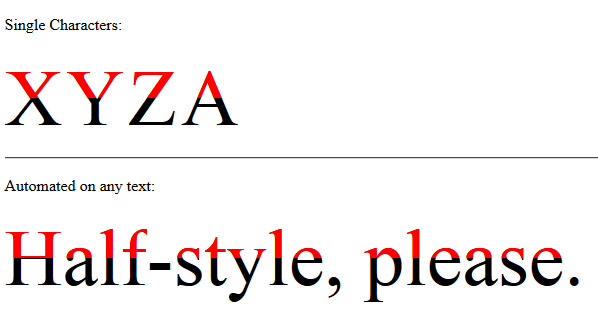 This technique will work with dynamically generated content and different font sizes and widths. It may be irrelevant, maybe not, but sometime ago, I created a jQuery function that does the same thing, but horizontally. I'm not saying this is the solution of any problems, but I already tried to apply css to half of a character, but horizontally, So the idea is the same, the realisation may be horrible, but it works. Ah, and the most important, I had fun creating it ! Here an ugly implementation in canvas. I tried this solution, but the results are worse than I expected, so here it is anyway. You can crowbar this code into doing all sorts of interesting things - this is just one implementation my associate and I came up with last night. The main reason I did this was to test myself and see if I was able to accomplish styling half of a character while actually providing a meaningful answer to the OP. I am aware that this is not an ideal or the most scalable solution and the solutions proposed by the people here are far better for "real world" scenarios. 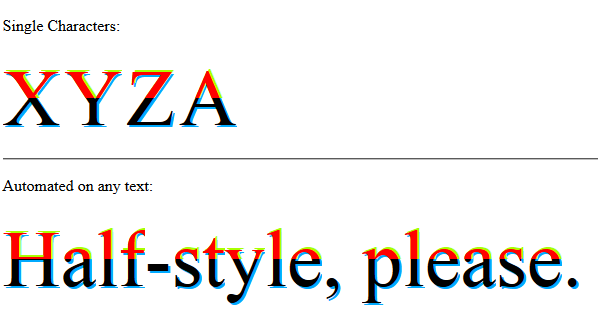 The CSS code I created is based on the first thoughts that came to my mind and my own personal approach to the problem. 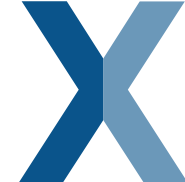 My solution only works on symmetrical characters, like X, A, O, M. **It does not work on asymmetric characters like B, C, F, K or lower case letters. How about something like this for shorter text? This can be achieved with just CSS :before selector and content property value. Just for the record in history! now if you want to make a gradient on text, you need to create some multiple layers, each individually specifically colored and the spectrum created will illustrate the gradient effect. and you can continue doing this pattern for a long time and long paragraph as well. What if you want to create a vertical gradient effect on texts? Then there's another solution which could be helpful. I will describe in details. what if you want to make these gradient effects to move and create an animation out of it? this is simply how we're creating gradients ( linear or radial ) on texts. If you liked the idea or want to know more about it, you should check the links provided. Maybe this is not the best option, maybe not the best performant way to do this, but it will open up some space to create exciting and delightful animations to inspire some other people for a better solution. It will allow you to use gradient style on texts, which is supported by even IE8! This is my first time ( yeah, after 5 years, you've heard it right ) to mention this repository anywhere on the Internet, and I'm excited about that! 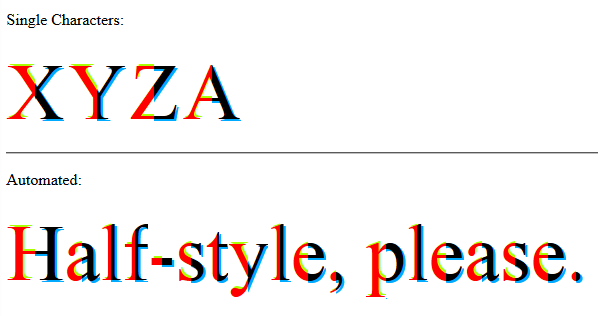 How to color fill a unicode (star: \u2605) character only half way in css/html? 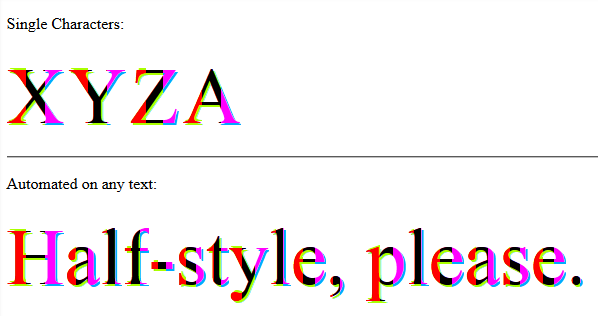 How to paint half of a letter or text in HTML(CSS)? Is there a way to partially fill text with different colours? Can HTML and CSS only create an overlay which ignores transparent area on an image automatically? How can I style a part of a single character with overlays using a dynamic width?